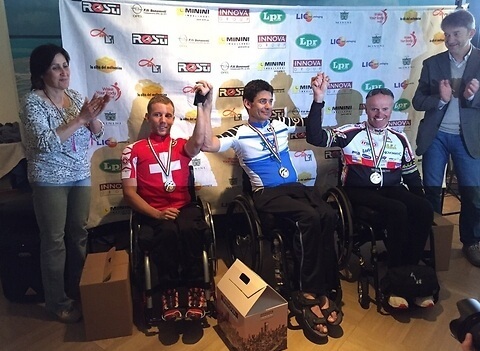 Koby Leon, Israeli Paralympic Silver Medalist (London 2012) and a member of the Hand Bike Team of Tel Aviv’s Beit Halochem, won the Gold Medal at the World Circuit Tournament competition which took place in the city of Mangiano, Italy. Leon won the race against the clock for a distance of 14.4 kms. in 25:31 min. In addition, he won the Silver Medal in the Road Competition. In December 1996, while serving in the ‘Egoz’ Special Forces Unit of the Golani Brigade, Leon was severely wounded in combat activity inside Lebanon, leaving him wheelchair bound for life. Paralympic Silver Medalist, a Zahal Disabled Veteran and member of Tel Aviv’s Beit Halochem, Doron Shaziri, won the Gold Medal at the Germany Open Competition. Shaziri, a leg amputee, shot X340 bullets in the three positions 50 meter air rifle competition accumulating 1.163 points. At the final Shaziri had 499.8 points which brought him to the first place, the Gold Medal and a sure place at the 2016 Rio Paralympic Games. Doron Shaziri served as a sniper at the ‘Orev’ Special Ops. Company of the Golani Brigade. In 1987 he lost his leg when he stepped on a mine while clearing the road to the Beaufort Fortress during operational activity in Lebanon. Beit Halochem Tel Aviv’s Women’s Goal Ball Team which is also Israel’s National Goal Ball Team, won the Gold Medal at the World Championship which took place in Seoul, Korea this mornign. In doing so, it has secured its place on the Israeli Paralympic Delegation to the 2016 Rio de Janeiro Games.